General Information: The humans generally very in height and size in every way and form, they are user's of every weapon, from swords, to bows, to magic. Their powers and specialties can very in every form, and their skin and hair, even their eyes can be nearly any color, as well their gene is neutral, allowing them to cross-breed with other humanoid sub-races, creating new branches of life in the world. They are fast learner's, and through this and their ability to adapt to nearly anything,t hey have claimed much of the lands of Shinma. General Information: Standing at average between 5'4" and 6' and weighing in between 130 and 170 lbs usually, true elves are a naturally slender and athletic race. Elves have a similar range of complexions to humans, with wood elves typically coppery or pale skinned and wild elves having darker pigmentations. Often, elven hair is dark, either brown or black, with copper red or blond hair also found amongst wood elves. Although orange or even green hues are not completely unheard of. Elven eyes are commonly brown, hazel, or an emerald green. Elves, like their cousins the Shadow Elves, are fair and beautiful, handsome, and have pointed ears and no body hair except eyebrows, eyelashes and hair. Elves mature at roughly the same rate as humans, though they are not usually considered past adolescence until they reach 110 years of age. Unlike humans, elves do not age dramatically as their lifespan comes to a close with the most obvious changes being a change in hair color, alternatively graying or darkening. Most elves remain healthy and full of life up until their death, which, if age-related, is usually between two and nine centuries. 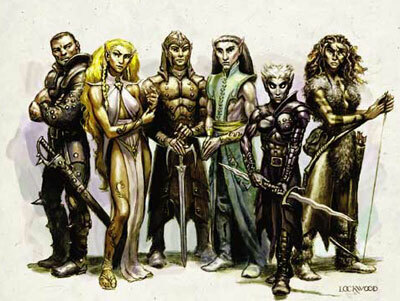 Each sub-race of elves has a different level of power, different unique traits and abilities though all are roughly the same power. All Elves: The Elven Race holds incredibly high-tuned senses and abilities connected to nature and magic, no matter what type they are. Half Elves: Born from a Human parent, and a elven parent, the Half-elves are unnaturally graceful and elegant, but hold rougher human features, being connected to magic and their elven blood, but its halved causing their aiblitites to be weaker. Aquatic elves are also known as sea elves. They live beneath the waves of Shinma and can breathe water as easily as their cousins on land breathe air. They can also breathe air but for a very short period of time. May RP Being able to Breath Underwater. Once known only as dark elves, one of their greatest kingdoms was Illythiir. They were transformed into Shadow elves and sentenced away from their brethren. Of all the elves they are the only ones that are inherently evil and hate their cousins with an undying passion. They are smaller than their cousins, both shorter and thinner. In addition, their skin resembles polished obsidian, and their hair is snow-white or silver. Their eyes are almost inevitably red, gleaming with the hatred for their surface dwelling cousins. May RP Being able to See no matter what time of day or night it is. The moon elves are the most common of all the elves in Shinma and are also known as silver elves. They typically have fair skin and hair that runs in hues from silver-white to black or blue. While human style hair colors are rare, eye color can be remarkably similar, with colors ranging from blue to green. The majority of the half-elves in Shinma come from parings between humans and moon elves. May RP having Visions of the Future, Very short and unclear Visions Out of combat, only 5 minutes into the future. With concentration and at the cost of their powers for the rest of the IC day (3 RL hours), they may see one whole IC day in the future. Only "ancient" elder silver elves may see up to centuries into the future, but not to modern times. 200 years, tops. Wood elves are a reclusive subrace, preferring to live in such areas as the High Forest. They place more emphasis on strength than learning. Wood elves are considered by other elven subraces (particularly the austere sun elves) to be boisterous and hedonistic. They have a zest for life and pleasure. They slowly formed for centuries from some of the other elven subraces after the last Crown War. They see their realms as the natural successors to past nations such as Eaerlann and Cormanthyr. [i]May RP being able to Track, and have Survival and Forest Knowledge of advanced levels. Players can create racial based techs and have a -2 to token cost. These techs can only be taught to others of the same race. If it can be taught to another race it is not racial and will be full price. Cost: Nothing, just let a DM, Admin, or Co-Admin Know you made One. General Information: Gnomes are very small compared to most other races and, with an average height ranging between 3'4" and 3'8" and a comparable weight range of 50 to 75 lbs gnomes are smaller even than halflings. However, while halflings are commonly said to resemble short humans, though they more resemble dwarves, who they are compared to due to their tendency to grow beards and live underground. Many gnomes have a more feral appearance than either, however, with hair that often sprouts from their heads in odd directions. The skin of gnomes runs in hue from reddish tans to earthy browns or even shades of gray, with exact hue somewhat dependent upon the ethnic origin of a gnome. Similarly, gnomish hair varies wildly in color from blond and brown to more exotic colors like white, orange, or even green. Gnomish eyes are often, particularly in individuals who are native to the Feywild, glittering black or blue although more natural eye colors are also known to the race. Gnomes are very long-lived, which means living over three centuries is not uncommonly rare and five centuries is not unheard of. Generally, gnome are considered to reach maturity at forty years of age. However, unlike elves, gnomes show a greater degree of aging as they grow older and once a gnome has passed his or her first century, their hair begins to gray, if it was not already white, and their skin begins to wrinkle as in humans or dwarves. However, even the oldest gnome retains a vitality that would be extraordinarily unusual amongst many of the younger races. All Gnomes: All gnomes, though not as strong and endurable as Dwarves, have a a strong Will and fortitude compared to other races, however to replace their lack of brute strength their race has a unnatural affinity with magic, along with their small size, the combination can be quite annoying to many opponents. They may RP Being fairly Durable, and having a deeper wisdom then most, and of course, their short. Jungle: The Jungle gnomes really are one of a kind in their race, they are masters of survival, and if you want a modern term, they are like pygmy Tarzan. They hate clothing and consider it a weakness to hide behind armor and shields, their weapons are relying on their natural surroundings, occasionally using spears and blowpipes that shoot darts of poison.They May RP Advanced Survival Knowledge, but they Dont Like Cloths that Much. Borrow: The Borrow Gnomes are mostly the more 'home-loving' of the Gnome race, they prefer not to adventure and stay with their homes and neighbors in their underground cities or villages, harvesting gems and metals, carving and crafting them into unique treasures to be held with pleasure, Because they spend so much time underground, but not so low as the shadow elves and dwarves, their bodies have adjusted, learning to feel the earth, and see in low-light.. They may RP Being able to See in lack of light, but not Utter Darkness, and can sense vibrations through the earth. Stone: If there is such thing among the humble race, the Stone Gnomes are the 'warriors' or 'adventurers' of the Gnome race. They are built a bit sturdier then their other cousins, and their hide is a bit thicker then others, they use their advanced craftsmen skills and strong arms and chests to the work of blacksmith and stone working, building great fortifications and armories, training themselves with every weapon they ever make, they are strong warriors, despite their small sizes.They may RP a Advanced Military Experience. 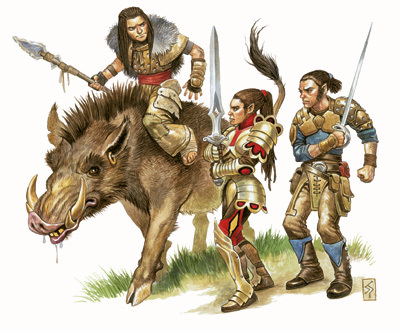 General Information: Halflings are small in comparison with the members of most other races, standing between 3'10" and 4'2" tall and weighing on average between 75 and 85 lbs. In many ways, halflings resemble small humans and usually have the same proportions as the typical human adult. Most halflings, regardless of their skin complexion, which has a similar range to humans, although it is commonly ruddy in hue, have dark hair and eyes. Nearly all male halflings are incapable of growing true beards, though many have long sideburns. Halfling hairstyles are often complex, with strands woven together or braided. Although halflings have an affinity for collecting valuables, they do not prefer to wear these on their person, instead preferring more comfortable clothing. Halflings have lifespans comparable with, but slightly longer, than humans. A halfling is typically considered an adult in their early twenties and some live into their 150's. All Halflings: All halflings, are small and slim, not like gnomes who are endurable and well-built despite their slimness, but truly lean and springy in build, causing their main ability to be speed and agility, as well as a keen mind and tricky personalities, this allows them resistance against Mind-affecting spells, as well as enhanced agility and small size for avoiding attacks.. They may RP Being fairly Durable, and having a deeper wisdom then most, and of course, their short. Earth: Halfligns of Mother Earth, these are masters of stealth and outdoor jobs, they are one with gardening, and tracking through the earth, being able to blend in with it easily no matter where they are if the earth is without grass. They may RP the Ability to Feel Vibrations through the earth. Hill: The Hill Hin are, in general, rogues, this is a stereotype in some ways, but it doesn't change the fact that they are also great scholar's, they spend much of their lives locked away in their hill-homes, reading and studying their lives away in a search for knowledge, and treasure. Generally they hire others to go and get these treasures however, not truly adventurous themselves.They may RP a Keen knowledge of Lore in the Lands of Shinma. Dune: The Dune Halflings are generally small bands of the Hin, as the race is called, that travel selling to travelers in caravans, they are masters of Survival, and the desert itself, able to survive for far longer then normal without foods and water, as well as able to eat nearly anything thanks to eating bugs, raw meat, and other unmentionable things to survive in their lives. They may RP a High Knowledge for Survival in the Desert, as well they may RP being able to Eat Nearly Anything Organic. General Information: Dwarves are a short race, as their name implies, standing between 4'3" and 4'9" on average, with gold dwarves a bit shorter. What Dwarves lack in height they make up for in bulk; they are, on average, about as heavy as humans. A dwarf can weigh anywhere from about 160 to 220 lbs. Dwarven males are a bit taller and heavier than their female counterparts. Like humans dwarves have a wide variety of skin, eye, and hair colors, typically pale among shield dwarves and deeply tanned or brown amongst gold dwarves. Hazel eyes are common throughout the race, with blue eyes more common amongst shield dwarves and brown or green eyes found amongst the gold dwarves. Male dwarves are often bald and grow thick facial hair sometimes used to display social status. It is a common misconception that female dwarves (with the exception of some gold dwarves) also do this, who instead braid their long hair. This hair is often dark in hue, though among shield dwarves blond or red hair is just as common. Gold dwarves take the care of beards to an extreme, carefully oiling and grooming it, and in some cases even gold dwarven females grow beards. Dwarves are a long-lived race, and reach physical maturity somewhat later than humans. A dwarf is traditionally considered an adult once he or she reaches age fifty. Dwarves age much like humans but over a longer period of time, remaining vigorous well past 150 years. Most dwarves live to see their bicentennial and a few live to be over 400. Mountain Dwarf: The Mountain dwarves are the first of the dwarves, they are the tallest of the dwarves ,though still only around 4'8'' tall, but by dwarf standards that's tall, they are built about twice as thick as the normal dwarf, and generally have tanned skin and brown to black hair,e ye color is nearly anything. They are incredibly strong and endurable, able to shrug off nearly any normal attacks and keep on bulldozing forward in a fight, hitting hard and strong.They may RP that they can shrug of most minor pain and wounds, these Dwarves are also the ones that are famous for their quality in terms of forging and other metalworking. Note: The 'RP information' part of each description is meant as a guideline. You are in no way obliged to follow it to the letter, though moving to far away from it (by creating an Ondode that would want to turn everyone to the 'light', for example) is discouraged and heavy disruption of the roleplay of the race will result in actions being undertaken. If you want to specifically create a 'comic-relief' character, a character meant only to lighten up people's day, please contact a DM before doing so. 'De ondode', or undead in the common tongue, is a mixed race of all kinds of abominations. Some resemble humans, while others are nothing more then walking masses of bones. They are generally shunned by all of society and when they're not they are being abused by evil ones for their own purpose. De ondode have their own city, hidden somewhere below the earth, and their society is not one for the faint of heart, purely based on having power and eradicating those that oppose you and manipulating those weaker then you. As an ondode, you start at a cemetery in [insert major city] and start your journey there. IC information: As an Ondode, you start as an Mindere; This is the result of a person bearing a grudge that grows out of hand, dominating their life, or their deaths. Due to the excessiveness of this grudge, a Mindere is born, simply put a grudge given a pseudo-physical form, capable of being seen by beings in the world, though they can't interact with it or vice-versa. Whether it's done through magic or just a phenomena in the world, no one knows yet. To normal people, you seem more like an see-through visage than an actual thing, and these are what the commoners would call 'ghosts'. You get stronger by absorbing grudges weaker then yourself and avoiding those that are stronger. This is instinctual, as most are incapable of normal thought and those that actually have the sanity to think at this point are only concerned about the grudge that created them. You prefer to absorb grudges similar to yourself, though others aren't ignored. RP information: You basically are only busy absorbing other grudges to get stronger. When you come in contact with other beings you will either ignore them or, for those more sane, try to get them to help you with your grudge, though they can't. You are capable of simple speech, normally existing of only a few (and probably incoherent) words. You can not come in contact with anything but other Mindere or Verzamelde (see below). OOC information: You start at one of the cemeteries in one of the major cities. You are an Mindere until you reach level 5, at which you'll turn into a Verzamelde. At this point of time you are unable to to leave the cemetery, as your only instinct right now is to 'feed' on other Mindere. IC information: An Verzamelde is a former Mindere that has absorbed so many other Mindere that he has increased in form and shape, gaining greater (though still not that great) amounts of power. You are still mainly focused on absorbing Mindere and other Verzamelde, though the best among the Verzamelde are capable of a bit of, though highly insane because of all the grudges inside of you, thinking, and might actually try to work with things in the physical world. RP information: You RP a Verzamelde much like a Mindere, including the inability to contact anything but other Mindere and Verzamelde, but you are capable of other thoughts outside your grudge, though that will highly influence your thinking. You are still only capable of simple speech, though, like with the thinking, you can speak of other things beside your grudge. OOC information: As a level 5 Mindere, You can leave the cemetery to some extend, and you must return after a small amount of time as your instincts drive you to absorb other spirits. (You are not meant to play some cliché bogeyman, rattling stuff around town, and are only allowed to do things concerning your grudge other then moving around. Failure to follow this will receive in a token dock, level dock, or, at highly irresponsible behaviour, deletion of the character and/or losing the privilege to play the Ondode race). IC information: The temporary stage of an Verzamelde reaching the pinnacle of his power, this is only the prelude to becoming a 'Grafeter'. RP information: Much like the Verzamelde, though with the urge to obtain a physical form and work on whatever your grudge may be. OOC information: Choosing a shape that is appropriate for the 'Grafeter' will make the DM replace you to the Ondode helper and make you select a new appearance. IC information: The Grafeter is the result of an Collectief inhabiting a body of a recently deceased. He then manipulates that body through sheer force of will and continues to do what he did before: Eat, only this time he eats the corpses around him instead of grudges. Though he continues to eat without stopping at first, the effects of an collectief inhabiting a body soon become visible, as the body starts to grow back to normal, until it resembles a human again. Though it resembles a human, there are normally some slight, or big, differences from other humans; Abnormally long nails, strangely coloured eyes, skin and/or limbs. Also, while they resemble humans, they still have to continue eating corpses, or even the living if they can get away from it. And while they are, in fact, humans now, they are still quite 'mad', still obsessed with their grudge and uncommon to normal society, often leading them being hunted down and them seeking refugee in the Ondode city. RP information: This is the result of a Collectief retaining his 'own' grudge after absorbing so many others, and the Collectief's intention of immediately wanting to do something about his grudge. You start out as a normal 'zombie' type of character, maintaining your simple speech and your primary objective 'eating'. Also, you can normally interact with the world now. After a while (see OOC information) you start to turn more human and can interact with society, though you won't fit in as you're obsessed and socially retarded unless you've had a lot of interaction with normal humans before (basically, you have to 'learn' how to interact with society). In the Ondode city, Grafeters are seen as something only slightly above the level of slaves; They are tolerated to have houses of their own, and are mostly left alone, yet a lot of the higher ranking undead see them as cockroaches infesting their city. Once they reach the pinnacle of their power, they become a Grafheer (male) or Grafdame (female). OOC information: You start by eating corpses of the dead, other Grafeters or the occasional unfortunate living person that stumbles into the cemetery. Once you hit level 15, you can choose a human-like appearance. From level 15 forward, you can (with the required INT/WIS) start learning magic, though convincing any non-Ondode to teach you would be hard. On level 25, you become a Grafheer/Grafdame (see below) and receive your first personalised power that can be related to the disfigurements you have, though it doesn't have to be. IC Information: At this point your path can split up, because, as a Grafheer(male) or Grafdame(female), you're powers start manifesting in yourself. 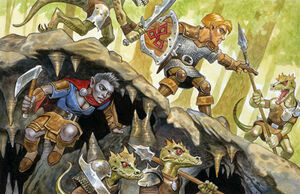 These powers can range from slightly inhuman feats to complete abominable transmutations. This can affect your physical form, though it is a misconception among the Ondode that the more powerful Ondode have purely humanoid forms, even for their powers. Your powers can also permanently affect your appearance, making you look like a complete freak-show, unlike your previous form. In Ondode society, you're still the lowest of the lowest once you start out, though this can quickly change if you prove your strength to other members of the society. A lot of new Grafheren and Grafdames try to prove this by beating up and killing off weaker people, a commonly accepted method among the Ondode. At this point, you no longer rely on the eating of corpses, though it isn't frowned upon and a lot still do it. Those with a really high potential advance beyond this point, leading up to the fearsome Grafvader (male) or Grafmoeder (female), creatures of immense power that would inspire fear into common Grafeters merely by being near them. RP information: You roleplay the Grafheer/Grafdame much like a Grafeter, as you still act towards your grudge (unless you've gotten rid off it in some way by now) and probably with a lot more ambition, as society finally acknowledges your position. The ultimate aspiration of any 'normal' Grafheer/Grafdame is to rise to power and reach their final stage as a Grafvader/Grafmoeder. If it wasn't already present, arrogance and pride usually arise in the personality of many Ondode at this point, especially after a few victories in battle. OOC information: Once you reach level 25, you'll post a power request, with your own personalised powers, in the appropriate 'Ondode' section of the power forum, and after it's been evaluated, you'll send it to an Ondode DM, who will balance it with the help of the other DM's, if necessary. Until those powers have been made and given to you, together with the appropriate gear, you're still counted as an Grafeter and cannot level beyond level 25. IC information: The Grafvaders and Grafmoeders; The pinnacle of the Ondode race, the ending point of a once so simple grudge. They are feared and respected by their underlings, and they would be by the other races. However, a Grafvader/Grafmoeder appearing in public is a rare occasion indeed, and the few that would actually lay eyes on one of them would very soon be incapable of laying eyes on anything else anymore. They are the leaders of the Ondode faction, leading their underlings into battle for their own goals and not even blinking an eye should all of them be wiped out. Some of them resemble normal-looking, yet terrifying, humans, while others are something that wouldn't even fall under the category of aberration. RP information: Most Grafvaders/Grafmoeders are roleplayed as the leaders they are supposed to resemble, intimidating, persuading, coarsening or manipulating those around them to work towards their own goals. Rare among the already rare Grafvaders/Grafmoeders are those that would rather free-lance around the land, though, if by this point in time, they still haven't gotten ride of their initial grudge, it wouldn't be unexpected. Lower ranking Ondode respect your power with a mere glance, and even if they look human-like their presence upsets and scares away even those that have never seen an Ondode. OOC information: Upon reaching level 35, you can request to become a Grafvader/Grafmoeder, at which point the Ondode DM's, and perhaps other DM's, will decide if you are allowed to become such. This is based on your overall activity, RP abilities and the status that you have in your in-game community. If all conditions are set, you can post your second power idea and deal with it like you did with your first power, after which the DM will give you the powers and gear. Up to that point you're not allowed to level beyond level 35 and are counted as a normal, yet powerful, Grafheer/Grafdame. The forbidden powers, the pinnacle of power that any creature can reach. They are often more dark and evil, making even the worst Ondode shudder in sheer fear. However, as feared as the powers are, Forbidden powers aren't as frowned upon as they are in other society; Quite the opposite, the day that a Grafvader or Grafmoeder were to gain this limit of their powers could be considered a national holiday. Those that receive it are respected and feared even more than they already were, leaving the ones that manage to survive the tedious work required for gaining such powers as the true 'nobles' among the race.